How do we know that the gas chamber at Auschwitz I (the Main Camp) is authentic, not a fake created for tourists? The Auschwitz-Birkenau State Museum officials have confirmed that the gas chamber in the Main Camp (Auschwitz I) is a fake created for tourists. 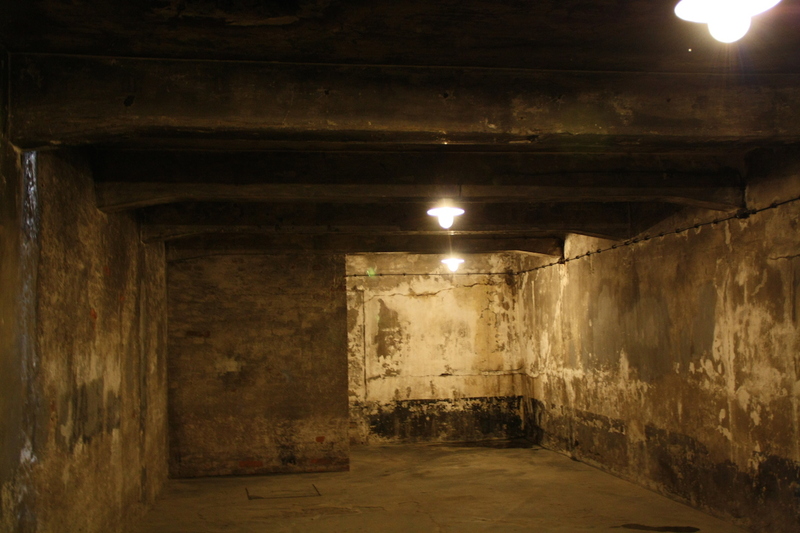 The crema/gas chamber in the Main Camp (Auschwitz I) has been accurately restored to its historic role as a gas chamber. It is meant to be a memorial and symbolic representation of all the cremas/gas chambers in the Auschwitz-Birkenau camp complex. Originally, Crema 1 was equipped with two (later three) cremation ovens with a morgue room behind them. In late 1941, the Nazis sealed up the morgue room in Crema 1 and punched five holes in the roof. The holes were capped with small chimneys through which the Zyklon-B was dropped. A large fan was also installed and the door was made gas tight. On February 15, 1942, the first transport of Jews from Upper Silesia was gassed in Crema/Gas Chamber 1. The gassings continued until the fall of 1942 when the murder operation was moved out to Birkenau. When the Nazis transformed the building into an air raid shelter in 1944, the ovens were dismantled and the holes in the ceiling were filled in. The rooms were subdivided with strong walls, to support the ceiling and minimize the effects of a direct bomb strike. After the war, the Main Camp was turned into a museum. Authorities felt that a crematorium/gas chamber was required at the end of the memorial journey for visitors. However, the four main cremas/gas chamber buildings, where most of the mass murder took place, lay in ruins in Birkenau, over three miles away. Therefore, the Museum authorities restored Crema/Gas Chamber 1, according to Nazi blueprints from September 25, 1941 and eyewitness testimony. As a partial reconstruction, this gas chamber speaks for the existence of all the cremas/gas chambers at Auschwitz-Birkenau. Subsequently, several other features were rebuilt or restored: the chimney for the crematoria ovens, the gas chamber room, the doors, two of the three ovens, and four of the roof openings used for Zyklon-B. Crema/Gas Chamber 1 in the Main Camp is not a “fake” but a space accurately restored to its historic role as a gas chamber. It is meant to be a memorial and symbolic representation of all the cremas/gas chambers in the Auschwitz-Birkenau camp complex. Interior of Gas chamber in Main Camp. By Illogical2007 (own work) [CC BY-SA 3.0], via Wikimedia Commons. Eric Conan, “Auschwitz: La mémoire du mal,” L’Express, 19 Janvier 1995 at www.fpp.co.uk/Auschwitz/docs/Conan.html. See also Robert Jan van Pelt, The Van Pelt Report “(XI Irving Adrift [1993-1998]”) at https://www.hdot.org. Robert Jan van Pelt, The Van Pelt Report (“XI Irving Adrift [1993-1998]”) citing David Irving, “L’Express: ‘Tout y est faux” – Everything About it is a Fake, French Make a Clean Breast: Admit Forty-seven Year Auschwitz ‘Gas chamber’ Fraud,” Action Report #9, May 1995. Franciszek Piper, “Gas Chambers and Crematoria” in Yisrael Gutman and Michael Berenbaum, Anatomy of the Auschwitz Death Camp (Indiana University Press and United States Holocaust Memorial Museum, 1994), p. 159. Robert Jan van Pelt, “A Site in Search of a Mission” in Anatomy of the Auschwitz Death Camp (Indiana University Press and United States Holocaust Memorial Museum, 1944), p. 145. Deborah Dwork and Robert Jan van Pelt, Auschwitz: 1270 to the Present (W.W. Norton, 1944), pp. 363, 364. Robert Jan van Pelt, The Van Pelt Report (“XI Irving Adrift [1993-1998]”) fn 1066.